Leading Manufacturer of kumar triple chamber oil expeller from Thane. Kumar New Super Press Triple Chambers Oil Expellers are designed for greater flexibility, capacity and efficiency. The expellers are supplied with 2 to 6 stage stack cooker for conditioning the oil seeds before crushing. These cookers are self driven with their independent geared motor. New Super Press Expellers are based on the latest design and technology due to the constant in house R & D resulting in energy efficient Expellers. 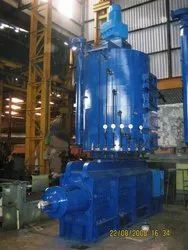 · New generation ‘CE’ Marked triple reduction gear box coupled independently with Motor. These are high efficiency, power saving and low maintenance and least down time. · Easy worm shaft removal without disturbing the gear box assembly. · Single piece steel cast chamber cages vertical split type hinged to body for easy and fast opening and closing for maintenance with the help of ratchet operating chamber hoist. · Self locking type clamping bolts, individual piece can be removed. Therefore require minimum labour. · Heavy duty cage bars for higher load duty. · Heavy duty main shaft. Looking for Triple Chamber Oil Expeller ?